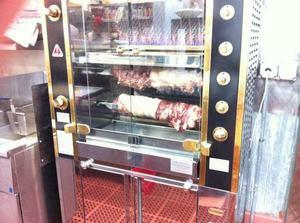 The rotisserie at Elmira. Photo from Facebook. The counter at Rhea’s Café. Yelp photo by Cherylynn N.
The new counter at DRIP’D. Photo courtesy of DRIP’D. Open as of today in Civic Center is ~ELMIRA ROSTICCERIA~ from chef Marc Passetti, formerly of the Fairmont. The name comes from the street in San Francisco where Passetti’s parents and grandparents grew up, which is so sweet. The menu is all about Italian-influenced sandwiches, salads, and breakfast. In the sandwich department, look for the lampredotto (a traditional Florentine tripe sandwich), roasted pork with fennel pollen and salsa verde, and roasted eggplant with peppers and smoked mozzarella. They’ve also got farro salad, a crispy pork salad, and a chopped salad. The menu will change seasonally, with lots of items sourced from the neighboring UN Plaza Farmers’ Market, and should expand to include a few more sandwich offerings in the next few weeks. At breakfast, find housemade pastries, steel-cut oatmeal, a three-cheese omelet with herbs, and a breakfast egg sandwich with the option of either bacon or speck. They’re serving coffee from Bicycle Coffee Co. and beer from a few local spots like 21st Amendment, Anchor, and Speakeasy, for now. There’s also a wine list coming soon, but it hasn’t been finalized yet. Once the beer and wine program has expanded and been finalized, they’ll add happy hour too. Hours are daily 7:30am-7pm, breakfast until 10:30am, then lunch until closing. 154 McAllister at Hyde, 415-551-7332. After running ~PISTO’S TACOS~ for a couple of nights last week, owner Pete Mrabe closed the space and decided to change the concept since the space wasn’t suited for what he wanted to do there. So instead of taking tacos off the menu at nearby Don Pisto’s, he’s going to launch his raw bar menu items at this new 35-seat space instead (it’s going to be called ~PISTO’S~). As mentioned earlier in tablehopper, look for ceviche, oysters, and some cured and smoked fish. He is also going to offer a half-pound burger (to go only) for $6 and have just a couple of tacos on the menu (like suadero). The reopening is slated for this Thursday May 16th. Walk-ins only, open Thu-Sun 6pm-10pm. 1310 Grant Ave. at Vallejo. Now open in the Mission is the second location of ~RHEA’S CAFÉ~. 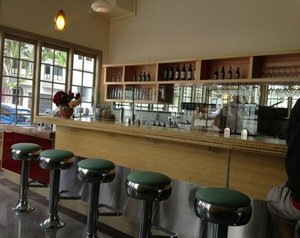 Like we said earlier, it was going to open in the former Deli-Up Cafe space at 20th and Bryant, and there’s a counter with seating (the original location in the market on Valencia is takeout only). Yelpers and the readers on Mission Mission are squawking over the higher prices on the menu ($10-$12 for those monster sandwiches). But yay, 30 seats. And as promised, the famed katsu sandwich is back, and there’s Korean fried chicken on the menu too. Way to work that fryer out. Open daily 11am-8pm. 2200 Bryant St. at 20th St.
Urban Daddy mentions the opening of ~PAPRIKA~ on 24th Street in the Mission, in the former El Trebol space. It joins other nearby beer-and-sausage places with European beers and traditional-style sausages. Yelpers report good sausage platters and happy hour beer prices. And apparently, they’re serving beer in the boot-style mug. Awesome. 3324 24th St. at Mission, 415-283-7941. 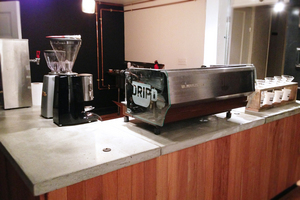 Due to potentially open this Saturday May 18th in the Inner Sunset is ~DRIP’D~. An earlier post on tablehopper said the project is from Chris Morell and Tae Kim, serving Sightglass Coffee (although they plan to roast their own coffee in the back later on). Initial hours are Fri-Sat 8am-2pm, Sun 9am-3pm. They’ll be expanding to six days a week very shortly after, as soon as in a couple weeks (closed on Mondays). They are also going to be hosting their first espresso workshop on June 1st, check out their events page for more. 1352A 9th Ave. at Irving.